The Bush administration’s invasion of Iraq was only the most extreme expression of that broader strategic concept. It assumed that the United States and Israel could establish a pro-Western regime in Iraq as the base from which it would press for the elimination of resistance from any of their remaining adversaries in the region. The U.S. invasion and occupation of Iraq merely empowered Shi’a forces to form a regime whose geostrategic interests are far closer to Iran than to the United States. And now the Mubarak regime is in its final days. As one talking head after another has pointed out in recent days, it has been the linchpin of the U.S. strategy. The main function of the U.S. client state relationship with Egypt was to allow Israel to avoid coming to terms with Palestinian demands. Although this is clearly the time to scrap that Middle East strategy, the nature of U.S. national security policy-making poses formidable obstacles to such an adjustment Bureaucrats and bureaucracies always want to hold on to policies and programs that have given them power and prestige, even if those policies and programs have been costly failures. Above all, in fact, they want to avoid having to admit the failure and the costs involved. So they go on defending and pursuing strategies long after the costs and failure have become clear. The ruling National Democratic Party’s policies secretariat has reportedly received a confidential memorandum from a member of the Egyptian Council for Foreign Affairs detailing Israeli designs to gain access to the waters of the Nile River in exchange for completing construction of the Gongli Canal project in southern Sudan. It is estimated that, when complete, the Gongli Canal project would increase Sudan’s and Egypt’s annual share of Nile water by between 10 billion and 15 billion cubic meters. According to the memorandum, Israel plans to ask for half of these amounts, for which it is prepared to pay US$0.1 per cubic meter. The memorandum also states that Israel has exploited the ongoing disagreements between the upstream and downstream riparian states in hopes of securing cheap access to Nile water. The memorandum concluded by recommending that the government import coffee and meat from the upstream states of the Nile Basin to ease the latter’s disappointment over Egypt’s current policy of importing these products from other countries. Investigating corruption and abuse of power, Hoang Hung made plenty of enemies in high places. His best known article is about how officials in Long An, after receiving bribes from developers, kicked hundreds of farmers off their lands to make way for golf courses. After his death, a colleague quoted Hoang Hung, “We’re soldiers on the media battlefield. We must dare to speak the truth, dare to fight for social justice in spite of harassment from many quarters.” Fifty years old at his death, Hoang Hung was too young to participate in the Vietnam War. His father, however, was a Vietcong who died in battle. Journalists, however, are a different story. They can still reach the masses. America has solved this problem by consolidating her media outlets. With countless newspapers and TV stations, there seems to be many voices speaking, but nearly all are manipulated by the same puppet master. As everyone sits in the dark, the spotlight is fixed on a tiny ring where there’s much flailing over next to nothing. Should anyone still manage to get out of line, however, America can always snuff him out, just like the Vietnamese did. Invading Iraq, we bombed the office of Al Jazeera and shelled the Palestine Hotel, killing three journalists. We also arrested Al Jazeerra’s al Sami al-Hajj and kept him in Guantanamo for six years without charge. In 2005, an American tank shot at a car carrying Italian journalist, Giuliana Sgrena, injuring her and killing intel agent, Nicola Calipari. With the 18-year-long Middle East peace process finally pronounced dead, is the Palestinian Authority finished too? That is the question being asked by Palestinians in the wake of a week of damaging revelations that Palestinian negotiators secretly made major concessions to Israel in talks on Jerusalem, refugees and borders. The PA — the Palestinians’ government-in-the-making, led by Mahmoud Abbas — was already in crisis before the disclosure of official Palestinian documents by Al Jazeera television last week. Now, said George Giacaman, the head of the Ramallah-based research centre Muwatin, which advocates greater Palestinian democracy, the PA’s “back is to the wall”. The question of the PA’s survival, and the future direction of Palestinian politics, has gained added urgency as the wider Middle East is rocked by unrest, from Tunisia to Yemen. Mahdi Abdul Hadi, the director of the Jerusalem think-tank Passia, said the Palestinians were “at a crossroads”. Although the streets had remained largely quiet until now, he said it was only a matter of time before Palestinians started to make clear their revulsion at their leadership. “It is now much clearer to Palestinians that they are living in a prison and that the PA leaders are there only to negotiate the terms of our imprisonment,” he said. He, like many other Palestinian analysts, declared the negotiations for a two-state solution over. That sentiment appears to be shared by a majority of Palestinians. A survey in December, before the leak of 1,600 official documents, by the Palestinian Centre for Policy and Survey Research showed that 71 per cent of Palestinians believed they would not have a state within five years. The percentage is likely to have risen sharply. In a sign of the mounting panic in Ramallah, Palestinian leaders frantically launched a rearguard action last week. Initially, they claimed the documents were fabricated, and suggested that Al Jazeera was siding with Mr Abbas’s political rivals, the Islamic party Hamas, to bring down the PA. But several officials have confirmed the papers’ authenticity, and the PA has redirected its main attention to discovering who was behind the leak. Mr Abdul Hadi said Palestinians would increasingly draw the conclusion that their intended future was living in “one binational state under an apartheid regime” administered by Israel. “At the moment Abbas has his followers out on the streets but the Palestinian people are awakening to the reality of their situation,” he said. Samir Awad, a politics professor at Birzeit University, near Ramallah, agreed that Israel was imposing a de facto one-state solution. “The fight for national independence is over and, if it is to survive, the PA must quickly reinvent its role. Palestinians are now in for the long haul: a struggle for their civil and political rights in a single state,” he said. Asad Ghanem, a politics professor at Haifa University in Israel and an expert on Palestinian politics, warned, however, that, as the PA faltered, Israel and the US would intensify their efforts to strengthen the authority’s security forces and its repressive role. With politics stifled inside the occupied territories, said Mr Ghanem, it was crucial that outside Palestinian leaders step in to redefine the Palestinian national movement, including Palestinians such as himself who live inside Israel and groups in the diaspora. Mr Giacaman said the PA had long ago outlived its official purpose. It was created by the Oslo accords as a temporary administration in the transition to Palestinian statehood, proposed as a five-year period during which Israel was supposed to withdraw from the West Bank and Gaza in stages. Since the Camp David negotiations ended in deadlock in 2000, the PA has clung to power, with limited control over less than 40 per cent of the West Bank as Israel has continued to build settlements in the area under its rule. But Mr Giacaman said such threats were hollow, designed to put pressure on Israel to return to negotiations out of fear that it would otherwise have to take on the heavy financial burden of direct military reoccupation. The most likely immediate focus, he said, was intensifying international action through the United Nations, by pushing for a resolution at the Security Council against the settlements. He also thought the PA would consider changing its position and actively championing the Goldstone Report, the findings of a UN commission that suggest Israel committed war crimes during its attack on Gaza in late 2008 and early 2009. One of the leaked papers revealed that Mr Abbas had agreed under US pressure to shelve the report rather than take it to the UN General Assembly. “The problem for the PA is that it needs to generate diplomatic crises to get the international community to intervene. But this will put it in confrontation with Israel and the United States. Israel can always threaten to cut the $60 million taxes it transfers every month to the PA,” Mr Giacaman said. The PA’s threat to unilaterally declare statehood and then seek recognition at the UN, he added, would not change the reality on the ground. “Even if most countries recognise the state, it will still be a state under occupation,” Mr Giacaman said. In the meantime, the diplomatic vacuum was likely to be filled by Israel. It could promote a plan similar to the one being advanced by Avigdor Lieberman, the far-right foreign minister, to recognise a Palestinian state in temporary borders. Or it could continue its separation policies, withdrawing from more of the West Bank and encouraging the Palestinians to take over what was left behind. Mr Awad said the collapse of the PA held out many dangers for the Palestinians. One was the possibility of a convulsive civil war between the Fatah party of Mr Abbas and Hamas. Another, he said, was the “Aghanistanisation” of the occupied territories, as tribal warlords took limited control of the territorial enclaves Israel was not interested in. January 31, 2011 Posted by aletho | Ethnic Cleansing, Racism, Zionism, Timeless or most popular	| Comments Off on Can the Palestinian Authority Survive? 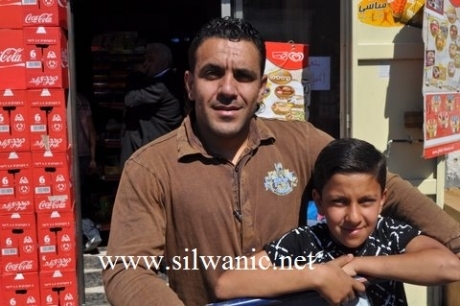 Israeli special forces raided homes in Silwan today at dawn, including that of banished al-Bustan Popular Committee member Adnan Ghaith, and attempted to arrest his son. When police attempted to arrest Adnan Ghaith’s 11 year old son, Oudai Ghaith, the family refused to hand over the child. Police finally left the home on the condition that Oudai present himself at the police station at 10 a.m this morning. Adnan Ghaith, Silwan secretary-general of Fatah and al-Bustan Popular Committee member, is currently serving his 4-month exile sentence in Ramallah, banned from entering the Jerusalem region during this time. Israeli authorities invoked a military law dating from the British mandate period to enable the banishment. Eyewitnesses reported that soldiers executing the raids were carrying tools used for breaking doors. Police also stopped residents in the streets in the outskirts of the Wadi Hilweh neighborhood and checked their ID cards. Troops were also sighted throughout Baten al-Hawa and Ein Silwan areas. Palestinian human rights defender and activist Ameer Makhoul was sentenced to nine years in jail on Sunday, 30 January on charges of spying and contact with a foreign agent. Makhoul, who serves as General Director of Ittijah – The Union of Arab Community-Based Associations and Chairman of the Public Committee for the Protection of Political Freedoms, was arrested on 6 May 2010, by the Israeli General Security Service and police. His original charge also included aiding the enemy (Hezbollah) in time of war, which in Israel includes a penalty of life in prison. Makhoul signed a plea bargain with the Israeli authorities on 27 October 2010, according to which he would be given a reduced sentence on reduced charges. “My husband is being punished severely today for supporting social and political justice. He has been wronged and by his sentencing they are trying to scare the Arabic population in Israel,” said Makhoul’s wife Janan in court Sunday. When Israeli General Security Service and police raided Ameer Makhoul’s home in Haifa at 6am on 6 May, and arrested him, he was taken to an Israeli security facility and kept from meeting with a lawyer or speaking with his family for nearly two weeks. During this time he confessed to the accusations. It is strongly believed that the confession was coerced. Although the Israeli authorities confiscated numerous computers and documents belonging to Ameer, the Ittijah organization and Ameer’s family, in addition to listening to over 30,000 conversations of Ameer in the previous two years, the Israeli authorities found no evidence against Ameer apart from his own statement. When a Palestinian is accused of endangering the state of Israel it is next to impossible to escape any time of prison time, even if there is little to no evidence to support the claim. Ameer now joins the thousands of other Palestinian prisoners, currently serving sentences in Israeli prisons from crimes they never committed. His family, friends and the community he served so faithfully will be anxiously waiting for his release. As people across Egypt continued resisting and rising against the brutal dictatorship of Hosni Mubarak it is quite clear they will not stop until he goes. Quite clear to everyone, that is, apart from the US Secretary of State Hillary Clinton who is so out of touch with what is happening on the ground you have to wonder who on earth is advising her. She appears to have no idea of the burning resentment and hatred held towards America among the ordinary men and women of Egypt. More than 100 have paid the blood price, so far, for standing up to the US-backed tyrant Mubarak and two thousand others are injured. It has been lost on no one that the empty shell casings from live ammunition and gas cannisters, which litter Tahrir Square and other streets across Egypt, were provided by the United States of America. The “Made in the USA” empty shell casings tell their own story not just of the innocents they have killed, but of their origins and of America’s deadly legacy of unwelcome foreign interference in the region. The Egyptian people have been fed propaganda for 30 years, their evening news on state TV is sanitized and censored and many have been afraid to speak out freely under the US-backed dictatorship of Mubarak. But do not for one minute think the Egyptian people are stupid – sadly the US has once again completely misread and underestimated an entire population. These demonstrations are as much a protest against US meddling in their affairs as they are against the Mubarak regime. Despite all of this Clinton showed not one ounce of compassion or humility when she made her latest blundering speech. With the sensitivity of a bull in a china shop, she called for an orderly transition but only after heaping praise on the Mubarak government which has “made and kept peace with Israel, avoiding violence, turmoil and death in the region”. She told ABC News:”Democracy, human rights and economic reform are in the best interests of the Egyptian people.” These are the same people her own government ignored as they continued to fund and back Mubarak with billions of US taxpayers’ dollars over the decades. The BBC’s North America editor Mark Mardell says Clinton’s comments are a sign that the Obama administration is edging towards accepting, if not openly endorsing, an end to Mubarak’s rule. The truth is, Mark, the Egyptian people do not want any more US interference – they do not want any more American weapons being used against them. America has no interest in the people of Egypt. Its only concern is for the man-made-pariah state next door – Israel. Clinton has been so out of step since this whole turmoil began to erupt. Both she and Obama remained completely silent for four whole weeks as scores of Tunisians died in that uprising and it was only when their man, Zine El Abidine Ben Ali took flight that they condemned his brutality. When Egypt threatened to kick off, Clinton said assuredly that the country was “stable”. That was a week ago and as she is beginning to learn, a week is a long time in politics. She says she wants democracy – but what sort of democracy Hillary? The sort that sees another tyrant take power? Or are you really going to let the people decide? And by the way, the people are beginning to rise and resist right across the Maghreb, throughout the Middle East and Asia. US foreign policy has turned America into the most hated country in the world and if Washington really told Americans the truth, I know the millions upon millions of decent US citizens would be horrified by what is being done in their name. But the truth is the American people are kept well away from the truth and are among the least informed people in the world today. Few Americans have any idea that this and the previous Bush administrations do not want democracy in the region. In fact, they have collectively punished the people of Gaza for exercising their democratic right by voting for a Hamas-dominated government. This has not been lost on the Egyptian people Hillary who, by the way, have a great love for Palestine, a place in their heart, for Gaza, and an even deeper hatred and mistrust for the brutal Zionist state, which really does threaten peace and stability in the region. As I write this F16 fighter jets and attack helicopters, made in America, are flying overhead in Cairo to try to intimidate the Egyptian people. Too late – there isn’t an army in the world that can beat this peoples’ army. Their fear has gone. Your ill-informed advisers won’t tell you this, Hillary, but I hate to see an empowered female make such a prat of herself, so here’s a piece of advice. The time has come when you really must step back and take a vow of silence. Every time you open your mouth you are looking and sounding even more stupid than the female presenter on Egyptian state TV who assures us all is at peace with the world and the streets of Egypt are empty and calm. It’s been thrilling to watch Egyptian mass demonstrations roll back the ossified Mubarak regime, especially as events in Tunisia suggest a knock-on effect that has rattled the Arab world. But this drama can’t be read as the Arab world’s “Berlin moment,” as some have enthused. Yes, serious reforms are in the offing, especially regarding more genuine elections. But limited prospects for reforms are just as clearly indicated. Reading anodyne language from the US and Europe warning the power elite in Egypt not to use too much force against demonstrators while not mentioning Mubarak at all, we must assume that ousting Mubarak is “viewed with favour” by the West. This should be signal. The US, UK and the rest of Europe are not so much steering events as surfing a wave of popular mobilisation, which they have encouraged for some time, as the only way finally to dislodge Mubarak and his crony core. The happy (naive) interpretation is a confluence of Western and Egyptian interests and values regarding democracy and good governance, coupled with disgust in old dictators clinging to kleptocratic power. But since when has US foreign policy encouraged democracy for the benefit of ordinary people? In fact, this Western imprimatur signals some hard realist western interests—and some ominous undercurrents. 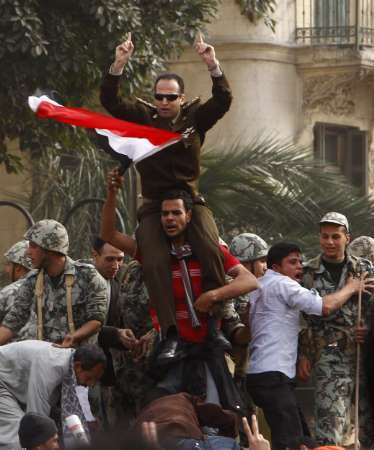 Western motives in ousting Mubarak are obvious. The old man has outworn his usefulness to the US in being unable to contain burning social dissatisfaction in Egypt, raising risks that Egypt might escape the grip of US foreign policy through the ascent of the Muslim Brotherhood. The US and Israel don’t want Egypt—in older days the leader of the Arab world and now a vital Israeli ally—going the way of Lebanon, where genuine democracy has allowed Hizbullah to control a parliamentary majority. It would be a disaster for Israeli if two of its borders fell into political hands less sanguine about starving the population of Gaza, ensuring the continuing division of Palestinian politics, training the security forces of the Palestinian Authority to repress Hamas, confining the ‘peace process’ to empty formulas, and demonising Iran. Hard if fragmented evidence of Western involvement is obvious, too. Many close observers are recalling a Wikileaks record that the US Embassy has been in contact with Egyptian activists for some years about getting rid of Mubarak, granting one key activist top-level access with US government authorities, technical advice regarding mass communication and other encouragement, and helping protect his anonymity. We can also recall Hillary Clinton’s recent tour of the Arab world, in which she made a series of speeches bizarrely endorsing the dramatic reform of US-allied Arab governments. Clinton sees the entire Middle East through an Israeli lens: if she calls for change, her concern is that Egypt and other Arab states be enabled to do their bit to sustain Israel’s ‘security’ more effectively. So US diplomatic graffiti is clear: the US wants to secure its withering power base in the Middle East against rising political dissent and therefore wants rotten old stick Mubarak out of the way to restore Egypt’s old leadership role. The same US graffiti is designed to be read by other wobbling Arab allies, like Yemen: toe the line or face the same. It takes little imagination to fill in the rest. In coming years, we’ll likely get a Wikileaks glimpse into the backroom conversation, held in the second or third day of the Egyptian insurrection, in which European, US and Israeli allies read Mubarak a literal riot act (pointing out the window) instructing him against all his druthers to appoint securocrat Omar Suleiman as deputy president. Suleiman is the ideal successor for US interests and has clearly been hand-picked now to take the reins. He’s immaculately polite (recall the Western appeal of Karzai) and ‘comfortable in the halls of power’, as al-Jazeera has noted. He’s a core high operator in Israeli/US foreign policy, including the ‘war on terror’ (supervising US-requested renditions, etc. ), and a good personal buddy of former Israeli prime minister Ehud Barak, with whom he once male-bonded in surviving a shared assassination attempt. He’s a proven ally in the deceitful manipulation of the Palestinian Authority: e.g., leading the phoney “unity” talks while supervising Egyptian assistance to the US in training PA armed forces to repress Hamas in the West Bank and ensuring the brutal sealing of Gaza. Best of all, Suleiman is an intelligence chief, welded firmly within the US-Israeli intelligence nexus that props up the Fatah-led PA, assists with the mess in Afghanistan, tortures or assassinates the more dangerous opponents to US and Israeli interests, and orchestrates the subversion of Syria and Iran. Such a figure, Washington must hope, can recreate an effective US-Israeli-Egyptian power bloc in a Middle East now drifting away from US moorings as Turkey, Lebanon and even Iraq progressively defect from Western-preferred policies. So, yes, the old fossil Mubarak has been cut loose and a ‘new Egypt’ (as presidential candidate Mohamed el-Baradei calls it) will soon be announced. The orange or purple or green or lavender or puce revolution will be applauded, the people will rejoice and more meaningful elections will be held. But Suleiman and his technocratic allies are already pre-positioned to ensure that the new Egypt precludes any access to real political influence by factions that, in the US view, are ominously closer to Hizbullah in their regional outlook. The whole point of the current drama is indeed to defuse the legitimate mass popular discontent that feeds the appeal of the Muslim Brotherhood—just as Hamas appealed to the disenchanted Palestinian electorate and Hizbullah has appealed to the disenchanted Lebanese electorate, the majority of whom otherwise don’t favour Islamic parties but were driven to support them through terminal political frustration. This new Egypt will definitely improve some conditions for some Egyptians over coming years: especially by creating jobs for the masses of educated unemployed men, who are now driving the street demonstrations. But reforms in Egypt will focus on technocratic economic solutions: emphasizing standard liberal capitalist measures regarding government and financial transparency, reduced corruption to encourage business growth, an end to routine police torture practices, etc., etc. The security state will otherwise stay in place—and the conditions for a highly unequal society will not fundamentally change. Egypt will stay firmly in the fold of US/Israeli security interests and global economic norms. It will just play that role more adeptly than before. Alas, the truly mass democratic character of this revolution actually favours this outcome. The demonstrators are calling, in principled fashion, not for any specific leadership but for genuine elections. It’s not impossible that more robust democracy will ultimately escape US control, as they did in Lebanon. But the hundreds of thousands now demonstrating in Egyptian cities lack the top-level access to prevent Suleiman’s security/technocrat network, with its foreign imprimatur, from ensuring that the ‘democratic’ transition generates simply a more efficient and stable version of the client-state role that Egypt has been playing for decades. Such a state cannot really alter the conditions that now impoverish and marginalise whole segments of Egyptian society. Some of the street activists recognise this, of course. Whether they can meaningfully alter the grand Western design for which their principled passion is now being co-opted is entirely unclear. Virginia Tilley is a professor of political science living in Cape Town, South Africa, hailing from vtilley@mweb.co.za. Fuad Ben Eliezer (Labour) does not understand what happened, and on all the radio stations he lays out his embarrassment: What happened to his friend Hosni Mubarak? Why didn’t he order the military to shoot the masses and thus end the “riots”, in his words? In light of his acquaintance/friendship with the Egyptian dictator, in recent days Ben Eliezer has become a senior analyst on Egyptian affairs, only that this time he admits, in uncharacteristic modesty, that he simply does not understand: a few hundred more dead and everything would return back to normal. The truth is that not only Ben Eliezer didn’t predict anything and understands nothing: all of the Israeli “analysts for Arab affairs” and “Middle East experts” – all of them graduates of Israel’s military intelligence or the Mosad – are forced to admit their ignorance. Yet again we were surprised, just like every time we are surprised: surprised by the crossing of Suez Canal in 1973, surprised by the Palestinian-Lebanese resistance in 1982, by the steadfastness of the Hizbullah in 2006, from the Hamas victory in the Palestinian elections and so on. In his words, Ben Eliezer reflects the Israeli media, which immediately chose a side: together with the forces of order, against the popular movement, even if, as in Tunisia, it involves the entire people. The Arab masses are always the enemy and the regimes – partners. The fact that these are authoritarian regimes, murderous and corrupted is perceived not as a downside, but as testimony to their welcome ability to control their populations. In simple words: while the Arab masses are a horde, a flock of inflamed savages, their leaders are guarantors of order, even if at times Israel is forced to go to war against them. Another surprise, and this time for the political and intellectual elites of the entire world, and not only for Ben Eliezer and “our commentators”: popular masses, from Morocco to Iraq, from France to Bolivia, did not read Fukuyama’s End of History and if they did, they refused to get off the stage of history: when they are stepped on, pushed to starvation or humiliated – sooner or later they rise up and remove the corrupt and arrogant dictators. Although it may be delayed, the revolution will eventually break out. To break out, not necessarily win, and it’s not inconceivable that Mubarak will listen to the advice of the Israeli press and of General Ben Eliezer and order the military to suppress the uprising with blood. It is already possible to guess the headline of the next stage of the press and expert commentators’ propaganda campaign: Al Qaeda. The dictatorship of Ben Ali and Mubarak is justified as they stop militant Islam and behind the popular demonstrations stands no less than Bin Laden. Zvi Barel (Haaretz, 30 January) is one of the few commentators who refutes the contention concerning the centrality of the Muslim Brotherhood in the Egyptian uprising. He emphasizes that its slogan isn’t Allah Akhbar but “down with the dictator, down with corruption”. Also in Tunisia the Islamic Al Nahda party didn’t play a role in the uprising, if only because it has yet to recover from the cruel oppression of Ben Ali and his gangs. Neither Al Qaeda nor the Muslim Brotherhood are behind the angry mass in Cairo, Rafah and Suez, but thirty years of authoritarian rule, oppression, poverty. As long as the Israeli commentators and politicians fail to understand this, they will continue to be surprised every time the masses (an “archaic” word long ago erased from their lexicons) take destiny in their own hands. The controversy over the firing of a Brooklyn College adjunct professor allegedly for his solidarity with the Palestinian cause continues. The college’s assertion that the teaching appointment of Kristofer Petersen-Overton, a doctoral student entering his fourth semester of studies at the CUNY Graduate Center, was canceled a week before classes start because of his “lack of qualifications” doesn’t add up. The dispute over Petersen-Overton’s course began after the class syllabus was circulated to prospective students. On January 12, a student worried about Petersen-Overton’s political affiliations emailed the department with the accusation that Petersen-Overton is an “active partisan of Palestinian in Gaza.” Bruce Kesler, who appears to have taken up the hobby of monitoring Brooklyn College’s assigned reading material and now teaching appointments, was quick to follow with a blog post condemning the hiring. When the department requested that complaints be deferred until after the class had started, and after students could point to actual evidence of Petersen-Overton’s supposed “bias,” the unidentified student—who was interviewed on WPIX New York with her face blurred—contacted Assemblyman Dov Hikind, Hikind is a supporter of illegal settlements in the West Bank and an advocate for the ethnic profiling of Arabs and Muslims. Hikind also played an influential role in the smear campaign that led to the removal of Debbie Almontaser from her position as the founding principal of Khalil Gibran International Academy, New York City’s first Arab-English dual language school—a decision which the Equal Employment Opportunity Commission later deemed unfair discrimination. Hikind called CUNY Chancellor Matthew Goldstein, and wrote a letter to Brooklyn College President Karen Gould in which he claims that Petersen-Overton’s “personal biases should not be allowed to pollute the academic realm,” citing a paper Petersen-Overton is in the process of completing, Inventing the Martyr: Martyrdom as a Palestinian National Signifier. In his letter, Hikind takes quotes out of context to back up his assertion that the paper “endeavors to justify and condone Palestinian suicide bombings as means of ‘struggle’ and ‘sacrifice.’” Hikind either deliberately misconstrues the essay, has not read it, or does not understand it. Like most academic essays, Petersen-Overton’s cites research, not personal opinion, and is about how Palestinian national identity manifests politically— clearly not a “romanticization” of suicide bombers. In a phone interview, Petersen-Overton recounted that, “within 24 hours of Hikind’s statement, I was fired,” adding that Hisseine Faradj, an adjunct professor who taught the same course before, is also a doctoral student. But according to Brooklyn College’s Media Relations Manager, Ernesto Mora, “Mr. Petersen-Overton was not fired because he had not been hired. This was an internal matter and the CUNY Chancellor had nothing to do with the provost’s decision, regardless of what Hikind’s releases argue.” However, Petersen-Overton says that he signed a contract with Brooklyn College on Monday. Mora also claims Hikind’s statements to the New York Daily News contains factual errors, and that no meeting occurred between the Provost William A. Tra­mon­tano and the Chancellor, adding that Hikind announced the decision that Petersen-Overton’s appointment had been canceled before the college did. The administration’s and Hikind’s narrative contradict both each other, Petersen-Overton’s own account, other faculty members, and that of Janet Elise Johnston, an Associate Professor in the Political Science department and a member of the Appointments Committee. Johnston says she was not present during the meetings on Petersen-Overton’s position, but claims that “the argument that it’s about qualifications doesn’t stand up to the evidence; we have other adjunct professors who teach for the Masters Program, but don’t have PhDs … he was not officially appointed by he had been asked to teach. He is qualified.” While Johnston cannot comment on the accusations that political motives propelled the decision to dismiss Petersen-Overton from his position, she maintains that “in reality CUNY and Brooklyn College are under funded, and under resourced, and have been so for decades,” which further explains the frequent appointments of doctoral students from CUNY programs. Currently, opposition to Peterson-Overton’s politically motivated termination is mounting. The Political Science department released a statement denouncing the decision: “His decision [the Provost’s] to reject our appointment undermines academic freedom and departmental governance.” The watchdog group Foundation for Individual Rights in Education sent a letter to the President Karen Gould calling for the reinstatement of Petersen-Overton as adjunct professor. “As you know, BC is a public institution and thus is both legally and morally bound by the First Amendment’s guarantees of freedom of expression and Academic freedom, ” the letter reads. Dr. Barbara Bowen, President of the Professional Staff Congress/CUNY, a union representing CUNY faculty and profession staff, released a statement condemning the decision as a politically motivated violation of academic freedom. And in an email circulated on a CUNY Hunter list serve, John Wallach, a Professor of Political Science at Hunter College and The CUNY Graduate Center, writes, “All of us who have taught him [Petersen-Overton] at the Graduate Center have written letters to the Provost, yesterday if not today, in addition to signing the petition. Uniformly, we find this action an abominable assault on academic freedom that must be reversed—immediately and without qualification.” The CUNY Graduate Center student newspaper, The Advocate, is also circulating a petition that has already received over 1,300 signatures, in addition to hosting a live blog which follows the case’s developments. Brooklyn College’s Political Science department will also be holding an emergency meeting on Monday to discuss the current situation. Zoe Zenowich is a Senior in the Scholars Program at Brooklyn College, where she is the managing editor of the Excelsior, a student newspaper. In response to the mass protests of recent days, Egyptian President Hosni Mubarak has appointed his first Vice President in his over 30 years rule, intelligence chief Omar Suleiman. When Suleiman was first announced, Aljazeera commentators were describing him as a “distinguished” and “respected ” man. It turns out, however, that he is distinguished for, among other things, his central role in Egyptian torture and in the US rendition to torture program. Further, he is “respected” by US officials for his cooperation with their torture plans, among other initiatives. Stephen Soldz is psychoanalyst, psychologist, public health researcher, and faculty member at the Boston Graduate School of Psychoanalysis. He is co-founder of the Coalition for an Ethical Psychology. Mention Richard Falk and you think of an honourable man who cares deeply about injustice, particularly the trampled rights of Palestinians under the evil jackboot. Mention Susan Rice, US Ambassador to the United Nations, and what comes to mind? She is also said to be “unwilling to consider opinions that differ from her own”. Falk’s crime was saying that the US administration’s reluctance to address the awkward gaps and contradictions identified by several scholars in the official explanations of 9/11, only fuels suspicions of a conspiracy. And he suggested that “what may be more distressing than the apparent cover up is the eerie silence of the mainstream media, unwilling to acknowledge the well-evidenced doubts about the official version of the events: an Al-Qaeda operation with no foreknowledge by government officials”. Fair comment, you might think. And carefully worded to cause no offence. But Reuters reported that UN Watch, an advocacy group affiliated with the American Jewish Committee, had written to UN Secretary-General Ban Ki-moon similarly demanding that he “strongly condemn Mr Falk’s offensive remarks – and … immediately remove him from his post”. The report added that UN Watch had targeted Falk in the past and frequently criticized the Human Rights Council for berating Israel while ignoring rights violations by developing countries. We agree wholeheartedly with the US Permanent Representative to the UN, Ambassador Susan Rice, who stated that Mr Falk’s comments are ‘despicable and offensive’ and, like her, urge the UN to remove him from his position. Falk has long been a conspiracy-ridden and harmful figure who surely does not serve the best interests of the UN. “Noxious” – that’s Rice’s word. Could they be sharing the same scriptwriter? Thursday, 20 January: UN Watch takes action and files complaint with UN Secretary-General Ban Ki-moon, demanding he condemn Richard Falk, the UN Human Rights Council’s permanent investigator on “Israel’s violations of the principles of international law”, for his latest remarks suggesting that the US government – and not Al-Qaeda terrorists – destroyed the World Trade Centre. The protest came as part of UN Watch’s three-year campaign to expose and combat Falk’s denial and justification of Hamas and Al-Qaeda terrorism, and his material support for 9/11 conspiracy theorists. At the daily UN press briefing, when Matthew Lee of Inner City Press asks for a response, the secretary-general’s spokesman says they don’t comment on independent experts. Monday, 24 January: The United Nations sends letter to UN Watch with unprecedented condemnation of a UN Human Rights Council official: “The secretary-general condemns [Falk’s] remarks. He has repeatedly stated his view that any such suggestion is preposterous — and an affront to the memory of the more than 3,000 people who died in the attack”. UN Watch immediately releases the letter to the public, and calls for the UN to fire Falk. Tuesday, 25 January: US Ambassador Susan Rice condemns Falk and echoes UN Watch’s call for him to be fired: “Mr Falk’s comments are despicable and deeply offensive, and I condemn them in the strongest terms… The United States is deeply committed to the cause of human rights and believes that cause will be better advanced without Mr Falk and the distasteful sideshow he has chosen to create.” Ambassador Eileen C. Donahoe, the US envoy to the Human Rights Council, also speaks out. SUCCESS: UN Watch’s campaign led to the unprecedented international condemnation of Richard Falk, who exploits his UN position to justify and deny Hamas and Al-Qaeda terrorism. It sparked dozens of news stories worldwide, as shown in the sample below. All of this succeeded in finally puncturing Falk’s undeserved halo as a “human rights expert”. For the first time ever, the UN itself had condemned Falk, and in the strongest terms. As a result, Falk’s credibility in the international arena is now at zero. What’s remarkable is how twitchy these people get at the slightest possibility that someone will lift the lid on 9/11, their hysterical protests serving only to deepen already serious suspicions. Incidentally UN Watch’s founder, chairman and executive director are all Jewish, the latter having worked at Israel’s Supreme Court. Gabi and I had the opportunity to work closely together on a series of important issues, from dealing with the deeply flawed Goldstone Report to seeing through the passage by the Security Council of the toughest sanctions resolution to date against Iran. She has been a lioness in defence of Israel’s security and its legitimacy — working tirelessly to ensure that Israel has the same rights and enjoys the same responsibilities as any other UN member state. We will continue to work together to seek a lasting and comprehensive peace that meets Israel’s security needs and creates a viable, sovereign Palestinian state. We will continue to strengthen Israel’s qualitative military advantage so that Israel can always defend itself, by itself, against any threat or possible combination of threats. And, as the president pledged, we will continue US efforts to combat all international attempts to challenge the legitimacy of Israel — including and especially at the United Nations. Having revealed herself as another handmaiden to the Zionist cause, Rice’s attack on Falk for breaking the ridiculous taboo and questioning the US administration’s refusal to hold a proper independent inquiry into 9/11 only raises questions about her own suitability for an important position at the UN. Meanwhile, there are millions of us out here who are right behind Richard Falk because he stands for justice. We are not amused by growing indications that the official story of 9/11 doesn’t add up. Nor are we too pleased by the realization that it was used to prod our own governments into sacrificing troops and treasure to a couple of unlawful, unwinnable wars that have caused mega-deaths and endless suffering to innocent civilians, trashed our good name abroad and made us vulnerable to reprisals at home – just to advance the crazed ambitions of the US-Israeli axis. In short, if there’s the slightest doubt we want to know the truth.